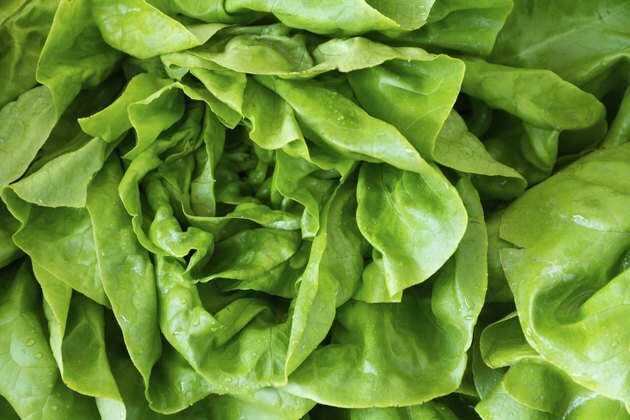 Lettuce can cause some digestive and bowel complications. Lettuce contains fiber, which is good for avoiding constipation, but it also can cause diarrhea and irritate certain conditions of the digestive tract. Before you decide to omit lettuce from your diet, consult with your physician. Lettuce has important nutrients that your body needs. One of the benefits of lettuce is its fiber content, but that can complicate other digestive issues such as diarrhea. If you suffer from diarrhea, drinking unpasteurized dairy products and avoiding fibrous foods, raw or rare meat or seafood dishes can help prevent the problem. The National Digestive Diseases Information Clearinghouse does recommend avoiding lettuce, fruit salads and other raw fruits and vegetables when you have diarrhea, especially if you're traveling. Diarrhea that lasts more than two days could indicate a more serious condition. Diarrhea that lasts up to four weeks or more could indicate a chronic disease. Certain foods can cause belching, bloating and gas. These digestive problems can cause pain and embarrassment. Some of these foods include lettuce, broccoli, Brussels sprouts, cabbage, baked beans, cauliflower, hard candy, chewing gum and certain fruits. Avoid or limit the amount of these foods that you consume to decrease symptoms. Certain foods, such as lettuce, nuts, raw vegetables and corn, cause incomplete digestion. Incomplete digestion can cause digestive problems for certain individuals, but especially for those who have had a colostomy. Incomplete digestion occurs when the food you've eaten does not break down all the way, which can affect your stools. If you suffer from some or all of these digestion problems, talk to your doctor about your diet. Lettuce may not be the culprit; it could be a different part of your diet. These symptoms also could be temporary nuisances from eating too quickly and swallowing too much air, which could lead to excess belching, bloating, gas or diarrhea.